The title of this post is a bit misleading. Using the plural “gifts” implies that I sewed more than one gift this holiday season when, in fact, this knit Renfrew top that I made for my sister-in-law is the only gift I had time to make. But, I thought it sounded better than “Sewing a Gift for the Holidays”, don’t you?! For some reason when I make up this pattern, I always seem to make it in multiples. The first time around I made four (here, here, and two here), the second time I made two (here), and this last time I made my maternity Renfrew and this one. They just come together so quickly that it wouldn’t make sense not to dig through my fabric stash while I have the pattern out! I made this one with fabric left over from my ombre striped shingle dress. 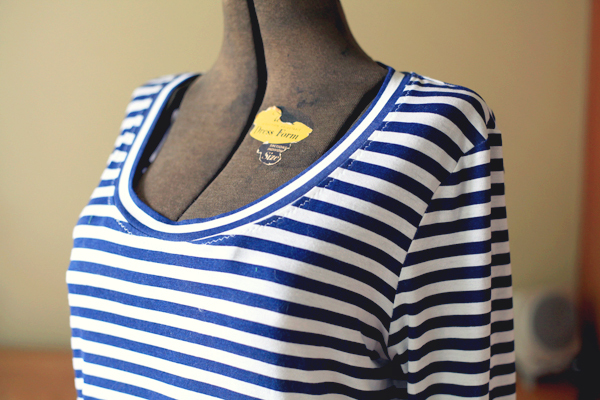 The navy-and-white stripe was my favorite of the fabrics from the four blues I used in that dress, so when I was placing my order, I made sure to order a little bit more of it in the hopes that I’d end up with enough to make this exact shirt. Only, because I had to make the shingle dress twice, I was close to not having enough fabric. In fact, I had to decide between skinny-ing up the long sleeves a bit or making three-quarter length sleeves. I opted for the former since I really had my heart set on this exact shirt. Though I did my best to match up the stripes at the side seams and along the sleeves, I learned a good lesson about where it’s most important to match stripes across the armscye seam. After throwing this top on my dress form for photos, I realized it would be the most visually pleasing, at least to me, to see the stripes match across the armscye seam a couple inches down from the top of the shoulder. I focused on matching stripes that were too low and that, as a consequence, are now hidden in the armpit. And, those visually prominent stripes a couple inches below the shoulder seam are just about completely offset! Even so, I still call this top a success, and I really hope my sister-in-law likes it. I think she could pull off the nautical vibe it has going on really easily. And, she wears the last one I gave her a lot, so hopefully this one fits similarly. Now to find the time to make my mom the capes and the little French jacket I promised her many Christmases ago! Oh! That’s too bad about the neckband. I’ve actually found the Renfrew to be the only one I can get right because I need the notches that Tasia so kindly included. I’ve had such poor luck when I’ve bound other knit neckbands, mostly while working from the Drape Drape books. I’ve ended up going to the binding neckline, but only after trying the band, which has made for some *really* wide necklines! It is a great gift, especially since the knit makes the fit so forgiving! It looks great! I love that pattern, it really does just come together! I see you recently made one, too! Hahaha! From what I’ve seen, you’re either knitting or making a Renfrew. I love your vintage-inspired dresses, too, though! This is really cute! The Renfrew pattern is a great one for gifts– I’ve made it for my mom and sister, and was able to get a good fit just guessing and altering without much thought. 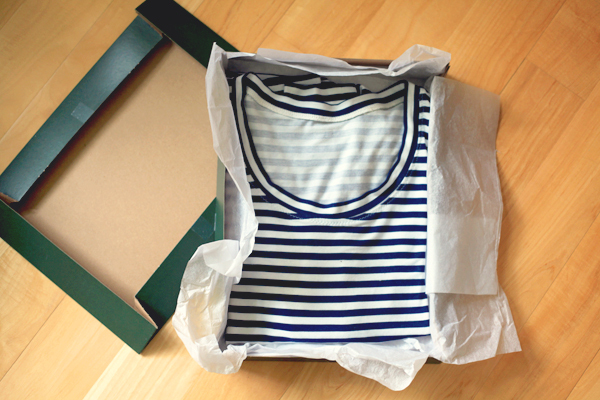 The stripes are beautiful– I bet she will wear it often! The gifts you’ve made have looked great. And, it’s so fun to be able to make something that pretty much fits the recipient with just a little bit of guessing! One gift is better than none, which is how many handmade presents I gave this year. You are a great sister for whipping this up during the busiest time of the year. Now, the question is, will you be making one for your little one? I think it looks great! And, personally, I prefer the non-match of the stripes from sleeve to bodice since it gives the eye something to break up a visually wider bust (my bust is wide enough) … so I’m all for the more slimming effect of NOT matching the stripes at the armhole seams. Ooooh! Good point. I hadn’t considered that. And, your someone who’s opinion on sewing I really trust, so thanks!! So cute, I just love blue and white stripes! I know. There is something about them that is so fun. 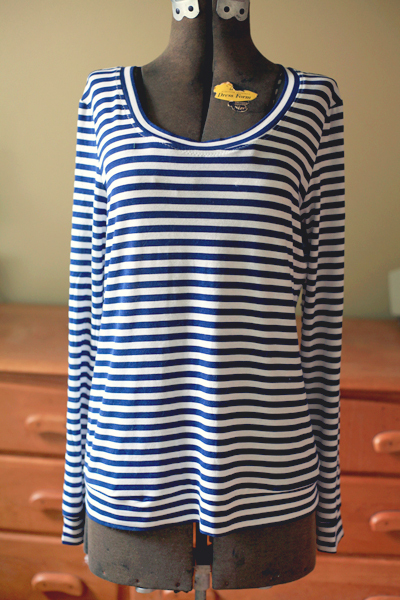 I love the stripes, and the length of the top! Thanks! The length is all Tasia though. I think it’s great, but I have a long torso. 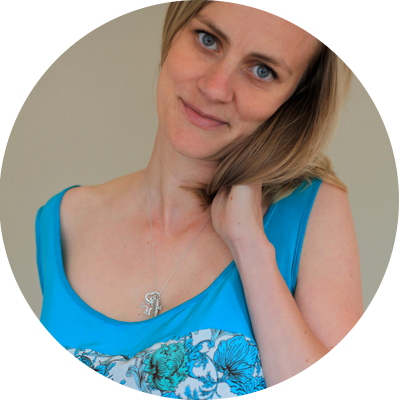 I have read on many other blogs that people have actually had more success taking off an inch or two. But, even so, I still agree with you about the length! You are very sweet to sew for your sis! I would never make anything for my sister hahaha! But I really like my sister in law and I would sew for her. The fabric looks so comfy and cute! Hahahaha! Your poor sister. But, yay for your sister-in-law!! Very cute! I’m sure she loved it! Cute and jaunty Amy! I like how some of your gifted presents from Christmases in the past have not yet been completed – now that is in true “Sew Maris” style. My kids received so many boxes of fabric for celebrations over the years! It is a great family joke! I know. Every Christmas I think back to those promised gifts, and I can’t believe I’ve let another year pass. But, it’s hard to sew something fitted for someone who lives 3000 miles away. Especially since I’m still so new to this game! I love this Renfrew. Cutting the neck binding lengthwise was a great idea. I love a nice striped t-shirt. This looks fabulous – I’m sure she loves it. the Navy style is pretty cute. I like this shirt, it looks amazing.